Isis was an Egyptian goddess and was worshipped as the mother of nature and magic. She was known to be a friend to artisans, sinners, and the downtrodden. This statement makes me laugh. I found this description on Wikipedia and the fact that artisans are grouped with sinners and downtrodden.... Well! This was a custom piece where the owner had been given a stone by one of her healers and wanted to make it into something that would be wearable everyday. The stone is Jade and throughout the world is thought to carry a sweet, light, nourishing energy. It's also been revered for it's ability to help clear your energy field. She named the piece and I think it's very fitting, don't you? Here's a few of the things that I had to take into consideration when making this piece. * Do I cover the back piece or make the pendant so that the back of the stone can be near her skin? I really thought about the purpose of the piece and knew that it would mean a lot of it was able to lay near to her heart. * Do I fabricate something from sheet metal or carve a wax? A wax carving, so that I can shape the wax to the gentle curves of the stone and still allow for the Jade to spin. * What's the overall theme and should I include other stones? The theme should be a shape that is powerful and feels like it will release magic and healing. I chose to accent the piece with a clear raw diamond since they have been used to detect and detoxify poison, open channels of spirituality and assist in calming. Jade. Bronze. Raw Diamond, Sterling Silver Chain. 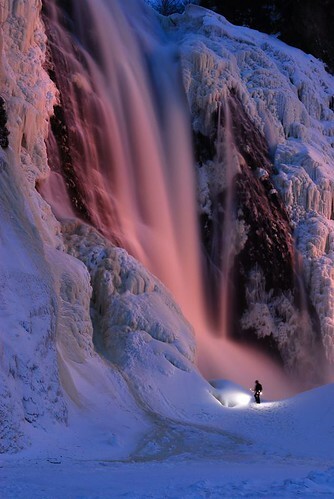 Kind of obsessing over this pic of frozen waterfalls. On the docket for craft night. A great way to liven up those boring pillows of mine. This 3-D embroidery technique would also be a great road trip project!